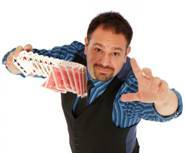 Robert Strong, The Comedy Magician has been crisscrossing the world since 1985 entertaining audiences large and small, young and old, formal and casual, and everything in between! Twice voted San Francisco’s ‘Best Comedian’, Robert has appeared on every major television network, in more than 40 different countries, in all 50 states, and twice at the White House. Inspired by TED, Robert launched a speaker series, Comedy Talks, in 2010 that celebrates the lives and careers of comedy legends.